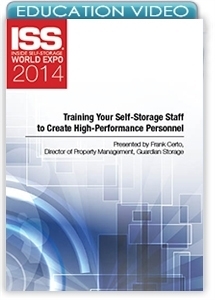 Learn how to build an effective self-storage training program, including systems and techniques, trainee testing, continuing education, and how to create a supportive, educational employee culture. You've created a great self-storage facility and put its future into the hands of a person who did not build it and does not own it—the manager. You're taking a tremendous risk unless you also take steps to ensure positive results. In this session, our presenter will teach you how to frame and build a staff-training program, including key points to consider. Whether you have one store or 100, you'll discover systems and techniques that will turn your newbies into contributing business partners and refresh your veteran staff. Self-Storage Facility Auditing: Does Your System Meet Up-to-Date Standards?